Home > Car Audio > Unloaded Sub Boxes > Dual 10"
We have a Dual 10" sub box for your system. From ported (vented) to sealed we have an enclosure that will work with your system. All boxes are constructed with high quality MDF and are built to last. All 10" sub boxes are built to fit most brands 10 inch subwoofer designs. 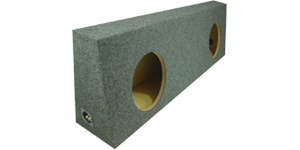 If you want a high quality 10 inch subwoofer box, at an inexpensive price you have found the rigt place.